About | Skate On This! Skate On This is a year-round, all temperature ice skating experience! Ice hockey, figure skating, special events or family fun, are no longer strictly seasonal activities. From the leading edge of plastics technology comes the “skate on this™“ synthetic ice-skating surface. 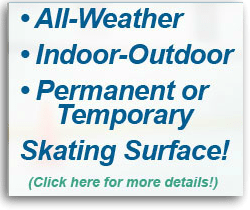 Suitable for temporary events and exhibitions to permanent installations at athletic facilities, parks, or entertainment sites, “skate on this” synthetic skating surface is lower cost than real-ice systems from engineering to maintenance. A rink can be nearly any size, from a 16’ x 24’ practice area to a 60’ x 120’ public rink, to a full-sized 85’ x 200’ hockey training rink. The value of “skate on this” is multifaceted, from flexibility in design and configuration, to ease of maintenance and modification. With a host of accessories and rink-side furnishings available from PMI, your facility can reap the benefits of synthetic ice like so many others around the world. To find out why synthetic ice skating rinks are being installed from China to Mexico City and all across the United States, Canada and the UK, contact PMI today.